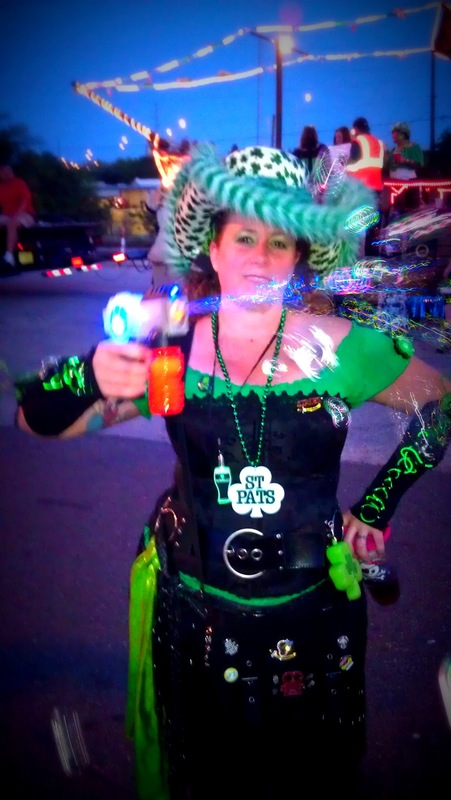 It was so much fun to blow bubbles with it before the parade and from the top of the float. The blaster lights up blue and shines a light from the front to illuminate the bubbles as they are rapidly dispensed. What impressed me most was how well it blew bubbles. I used this for a couple of hours without it clogging, dripping or foaming. It worked better than any other bubble blower I've tried! And, it looked so cool! It really was a big hit! Here I am in costume showing off the bubble blaster. This is sure to be the hit toy of the Summer, at all night time events. disclosure: I was provided the items in exchange for my review. The opinions expressed are my own. So, yeah, I really did love these! !